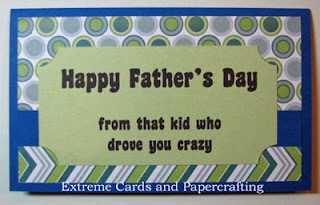 Happy Father's Day from the kid who drives you crazy! 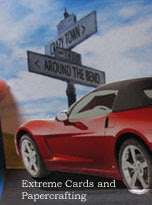 Simple pop up card with red Corvette convertible. and Photoshop Elements to combine the landscape and the sign, to paint in the asphalt, and to color-shift a blue car to red. 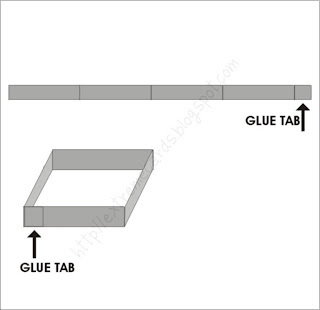 This is one of the easiest pop up cards to make, with a single flat element attached the the card back (upright) and floor with a strap or box. For this card I used two 3/4" square simple boxes, cut and assembled separately from paper strips, one behind each of the two rear wheels. 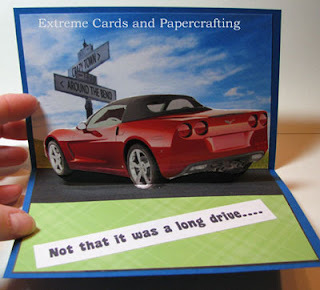 See this card by Polkadoodles for detailed instructions if you've never made this kind of pop up card before.